Within the framework of an EU-funded human rights project, the Civil Society Coalition against Torture and Impunity in Tajikistan is implementing the campaign “I am against torture today, tomorrow, always!” on the occasion of the International Day in Support of Victims of Torture, which is celebrated annually on 26 June. From 19 June until the end of June, the Coalition each day presents photo stories of victims of torture and ill-treatment on the Coalition’s website www.notorturetj.org and on its social media pages. All except for one of the torture victims whose stories are featured as part of this campaign died in connection with their detention, during interrogation in police custody, when completing their military service or when serving prison sentences. They were between 18 and 47 years old. Military conscript Shahbol Mirzoyev, whose story is also featured, was disabled as result of hazing in the army. 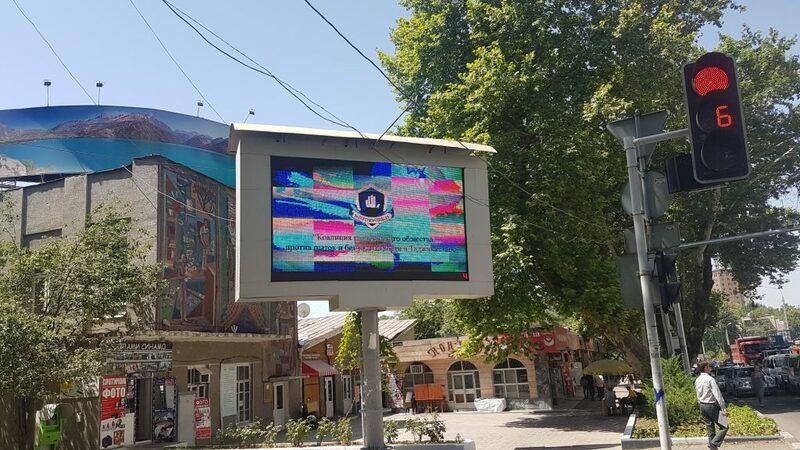 As part of the Coalition’s campaign, a video clip was also screened at large street monitors in Dushanbe (near hotel Tajikistan, TV station Safina and Ismoili Somoni monument) on 21-23 June. This video clip, with text in Tajik and Russian, was based on an excerpt from an address delivered by President Emomali Rahmon to law enforcement authorities on the issue of the inadmissibility of torture. The Civil Society Coalition against Torture and Impunity is also organizing a photo exhibition in connection with the International Day in Support of Victims of Torture. It will be held in Khorog and Vakhdat on 28 June in order to enable residents of these regions to familiarize themselves with the stories of victims of torture and ill-treatment in the country. The event is open to everyone. Last year, a similar photo exhibition was organized in the Khatlon and Sughd regions. Already in May 2017, the Civil Society Coalition against Torture and Impunity awarded a number of journalists and media outlets for their contributions to promoting awareness of the problems of torture and ill-treatment in the country. They received gifts and diplomas on World Press Freedom Day on 3 May. The Civil Society Coalition against Torture and Impunity in Tajikistan was established in 2011 to consolidate the efforts of civil society to combat torture and impunity. It unites 11 non-governmental organizations and about 80 lawyers, journalists, psychologists and legal experts. The campaign “I am against torture today, tomorrow, always!” is carried out within the framework of the EU-funded project “Coordinated civil society action to monitor the implementation of international and national human rights obligations in Tajikistan“, which is implemented by International Partnership for Human Rights (Belgium) and Nota Bene and the Independent Centre for Human Rights Protection (Tajikistan, members of the Civil Society Coalition against Torture and Impunity).